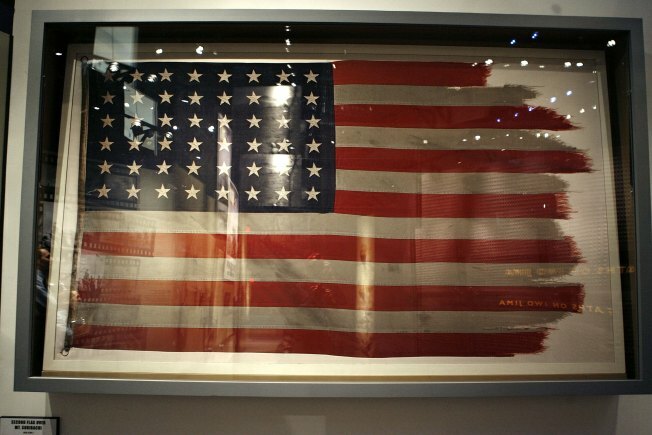 The flag raised during the WWII Battle of Iwo Jima and made famous by Associated Press photographer Joe Rosenthal was on display at the National Museum of the Marine Corps, Nov. 2, 2006 in Triangle, Va.
At the Wilton House Museum, an 18th-century plantation house overlooking the James River, a portion of a colonial waistcoat worn by the then-Lt. Gov. Alexander Spotswood is in disrepair. The framed fabric belonging to the man known for his defeat of the pirate Blackbeard is frayed and, without proper conservation, will continue to fall apart. Its condition has placed it among the nominees for Virginia's Top 10 Endangered Artifacts, a program designed to create awareness of the importance of preserving artifacts throughout the state and at museums and archives in the District of Columbia. The endangered artifacts program, sponsored by the Virginia Association of Museums, is raising attention -- and in some cases, funding -- for some of the region's most unique relics. And with so much history, it's no surprise many of the artifacts that help illustrate Virginia's past are in need of a little TLC. "When you visit a museum or a historic house or a library, as a visitor you see the finished product," said Christina Newton, project manager of the Virginia Collections Initiative at the Virginia Association of Museums. But behind the scenes, the work that had to go into more than likely restoring that object takes a lot of time and effort, expertise and funding. About 190 million objects held by archives, historical societies, libraries, museums and scientific organizations in the U.S. are in need of conservation treatment, according to the Heritage Health Index study. The study was done by Heritage Preservation with funding from the federal Institute of Museum and Library Services. In Virginia, an independent panel of experts will select the region's top artifacts in mid-September through the program, which was created last year and is expected to take place annually. The panel will use input from public online voting that runs through the end of August. The current top vote-getters include the remains of Spotswood's waistcoat; a locomotive from the early 1900s built in Richmond nominated by the Alleghany Historical Society; and a late-1800s ledger highlighting the African-American community housed at the Portsmouth Community Library and Black History Museum. "These are pieces of Virginia's history -- whether it's 20th century, 21st century or 18th century," said William Strollo, director of education and public relations at the Wilton House Museum. "It's something that students, adults, teachers, parents, anyone can connect to. ...It's more than just words in a textbook." While the Top 10 designation doesn't come with award money, officials say the program has helped some of those named on the list apply for grants and help with fundraising efforts. "It brought attention to the fact that our rail heritage is sitting in rust piles around the country and that to preserve our rail heritage is to preserve our history," said Peg McGuire, director of marketing for the Virginia Museum of Transportation in Roanoke. There are some things that are very important to our society that need to be preserved for future generations to learn about." Last year, the museum's Norfolk & Western SD45 Diesel Locomotive 1776 made the endangered list, helping it raise its own funds and a $10,000 Trains Magazine Preservation Award to restore the train to its original red-white-and-blue glory. The train, built in 1970, was chosen by the magazine from 120 submissions from all over the United States. The museum hopes another train nominated this year -- a deluxe sleeping car built in 1932 -- will garner some attention and raise more funding for its restoration, McGuire said. Other nominees for this year's designation include: the records of an African-American midwife at the Salem Museum; a spinet piano of Virginia Gov. James Barbour at the executive mansion in Richmond; George Washington's Revolutionary War camp stool at Tudor Place Historic House and Garden in Washington, D.C.; and a horse-drawn rock wagon at the Historic Crab Orchard Museum and Pioneer Park in Tazewell.